FENDI in partnership with The Wolfsonian–Florida International University invite you to celebrate Vogue Fashion’s Night Out, Atelier Fendi, and an exhibition of photographs by Karl Lagerfeld. 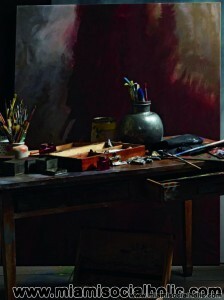 Hosted by Susanne Birbragher and Lila Segal Battista, The Fashion Week 2011 ad campaign, recreates the studio of the Dutch painter, Cornelis Theodorus Maria van Dongen. He developed the lush colors of his Fauvist style gaining a reputation for his sensuous, at times garish, portraits. He was a fashionable portraitist with a touch of playful cynicism. He has been noted as stating that, “Painting is the most beautiful of lies”. Karl Lagerfeld is a German artist, fashion designer, and photographer based in Paris, France. He has collaborated on a variety of art and fashion related projects, most notably as head designer and creative director for the fashion house Chanel. Lagerfeld helms his own label fashion house, as well as the Italian house Fendi. The event will takes place Thursday, September 8, on Fashion’s Night Out from 6:00 to 8:00 p.m. at FENDI, Bal Harbour Shops, 9700 Collins Avenue. Twenty percent of the proceeds that evening will benefit The Wolfsonian–FIU. Confirm your attendance by calling 305.861.7114. Become a member, or change your membership level by contacting Ian Rand at 305.535.2631or ian@thewolf.fiu.edu. 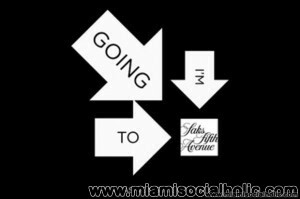 Styleist along with Newborn and Jack and Jill’s Children’s Center Presents Fashion’s Night Out at Saks Fifth Avenue Bal Harbour from 6:00 to 10:00 p.m., with 10% of the proceeds going back to the charity. Fashion’s Night Out is a global initiative created to celebrate fashion, restore consumer confidence, and boost the industry’s economy. Footwear designer Edmundo Castillo will be the guest of honor, and personally sign his latest collection. A hi-tech photo booth will let you capture and upload your latest look to Facebook. Shoot your own cover of Bal Harbour Magazine with a hair and makeup artists on hand. Check in with AOL’s Styleist, the source for the latest fashion news and trends, to test your Fall Fashion IQ and win prizes. Play Roulette and Blackjack in our Men’s department casino. Enjoy cocktails courtesy of GREY GOOSE Vodka, beverages by Coca Cola and Smartwater, bites by ONE Bal Harbour Resort & Spa and MISTER COLLINS, as DJ’s spin throughout the store. On Friday, September 9, the Bass Museum of Art will host an Opening Reception for its newest exhibition Vanishing Points: Paint and Paintings from the Debra and Dennis Scholl Collection. 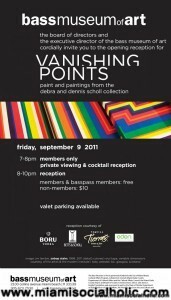 A members-only private viewing is scheduled from 7 to 8 p.m. A cocktail reception open to the public will take place from 8 to 10 p.m. While enjoying hors d’oeuvres courtesy of EDEN South Beach, Boru Vodka and Tierras Tequila cocktails, wine by Betts & Scholl and beats by DJ Le Commandant, attendees will explore the institution’s new exhibit. Organized by Miami-based artist and writer Gean Moreno, Vanishing Points presents 43 works by 27 contemporary international artists and explores how they interpret and how we perceive painting today. The exhibition highlights three viewpoints: Sweeping Horizontality and Aerial Views, The Painterly without Paintings and Impossible Task. Admission to the Opening Reception is complimentary for members and Bass Pass holders; $10 for non-members. For more information, visit www.bassmuseum.org, call 786.800.6302. Leonardo Hidalgo, internationally known pop artist based in Miami, will be telling the story of 9/11 from a unique and artistic uplifting perspective through his eye popping vibrant color large scale paintings. 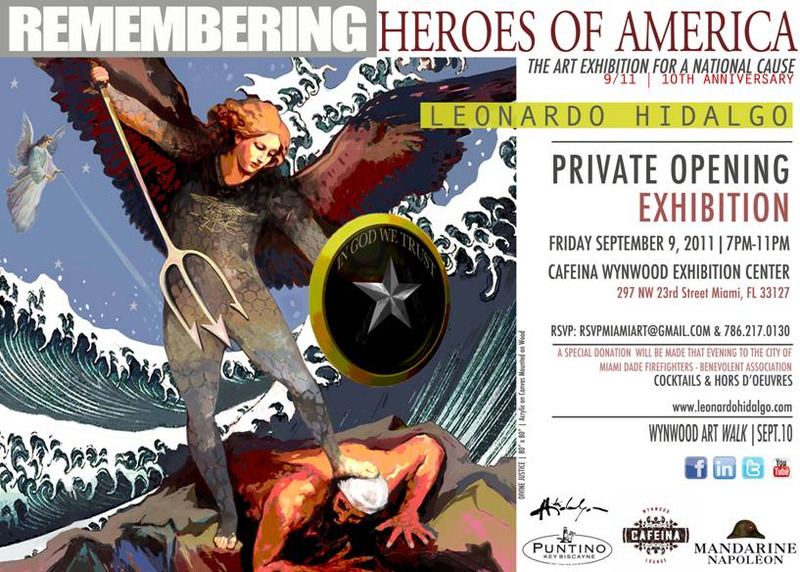 The private opening reception will take place this Friday, September 9, in honor of The City Of Miami Firefighters who will be in attendance at CAFEINA | Wynwood Exhibition Center from 7:00 to 11:00p.m. Hidalgo has created a visual feast of 12 large-scale paintings exploring the meaning of good and evil, freedom, liberty, the force of divine justice and superheroes. In these painting he wants to honor the memory of the lives lost in the attacks of 9/11, the firefighters, police rescue units and the soldiers who have sacrificed their lives to defend our liberty. Hidalgo says, “I think it will be a very special moment to be together that night with the firefighters, our true heroes, and honor them while REMEMBERING a moment in history that changed the world forever. I hope that with my art I can make people feel and believe in liberty, justice, and spread some heroic virtues in the consciousness of society.” Guests will enjoy complimentary hors d’oeuvres and cocktails by Mandarine Napoleon until 8:00p.m. Email rsvpmiamiart@gmail.com to attend the private reception; the exhibition will be on view from August 29 through September 15. Call 786.217.0130 for a private tour. Miami Children’s Hospital Fundraiser at the Well Miami Beach Attorney and Miami Children’s Young Ambassador (MCYA) Leadership Committee Member Michael Grieco and WSVN’s Louis Aguirre are hosting a fundraiser to support Miami Children’s Hospital (MCH) on Friday, September 9 at 7 p.m. at The Well on Miami Beach. MCYA is a membership organization for young professionals between the ages of 22 and 45 who have a strong commitment to improving the lives of children in our community and beyond. Members have the opportunity to network with prestigious business and community leaders, meet with key Miami Children’s personnel and determine how their donations can best be used to benefit the patients and families at MCH. With goal of helping children with medical needs and raising awareness for MCH, the fundraiser is open to the public and guests are encouraged to make a monetary donation at the door. To attend, contact Stephanie Cofino at Scofino@mchf.org or call 786.268.1719. Despite what Ari Gold thinks, Bobby Flay, (who has a recurring role on this season of Entourage) is one of our most celebrated chef’s and now he’s joined the Food Network in search of the “Worst Cooks in America”. This Miami Casting at Epic on September 16 and will be televised on the network. If you’re interested sign up today as space is limited. Sixteen of the country’s most hopeless cooks attempt to transform from kitchen zeros into kitchen heroes as they compete in a grueling culinary boot camp and led by Food Network stars Bobby Flay and Anne Burrell. 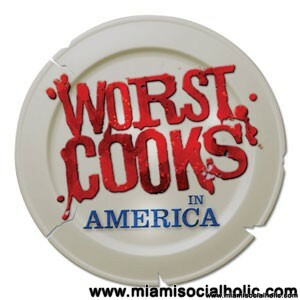 Email us at worstcooks@theconlincompany.com, tell us why you are the most disastrous cook in the country. 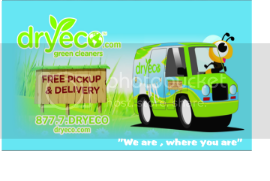 Include name, age, hometown, occupation, contact phone number and a recent photo. Don’t Miss: BASEL, Food Trucks, Jewels, and More!